Sandwich Panels / Insulated Panels. 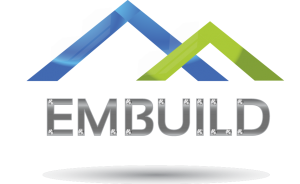 Sandwich Panels which are also known as Insulated Panels or SIPS. Insulation material sandwiched between two layers of material like Steel, Aluminium, plywood etc. Insulation materials include Polyurethane Foam (PU or PUF), Polyisocyanurate (PIR), Rockwool/Mineral Wool, Glasswool, Expanded or Extruded Polystyrene (EPS/Thermocol)….Insulated Sandwich panels have high strength ,energy saving insulation, flexible for variety of constructions. 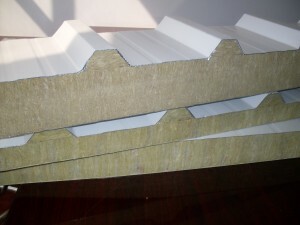 Insulated sandwich Panels feature not only efficient insulation but also high strength to weight ratio,Minimum Steel work and Load bearing foundation for installing these panels, reduced erection time, long life, maintenance free.Fire Self extinguishing, Fire Rated Polyurethane core sandwich panels are also offered.Hi Rib Trapezoidal or Corrugated panels are generally for Roof, side cladding application. Low/Micro Rib or Flat panels are for Walls, Partitions, Ceiling application. Hi Rib Trapezoidal PU(Polyurethane) Sandwich Panels :Profiles offered: 35(38)/200 and 45/250 are generally offered.Other profiles 25/252, 30/250, 45/150.40/250… are also provided.These panels are ideal for Roofing and side Cladding application. PIR (Polyisocyanurate) sandwich panels which are better in Fire Reaction than B-2 Type PU panels are also offered. “Low / Micro Rib PU or PIR core sandwich panels.” These panels are used for Partitions, Internal and External walls, Ceiling /False ceiling,.Widely used for construction of cold storages, Shelters, Office interiors , Return Air Boxing, AHU Enclosures …..These panels are provided without Micro/Low rib also for Clean room and Operation theatres construction purpose. EPS sandwich panels are considered as LIGHT WEIGHT construction material with good insulation value.Thermal conductivity of polystyrene (EPS) is 0.032 W/m.oCOffered with PPGI (Pre-coated Steel) and PPAL (Pre Painted Aluminum) as skin material.Thickness of the PPGI and PPAL sheet 0.4mm – 0.7mm ( Higher thickness can be tried)Hi Rib and Low Micro Rib Rockwool sandwich panels.Thickness 40mm to 100mm thick (Higher than this thickness is also possible/ can be tried)EPS density 16 Kg. To 18 Kg. 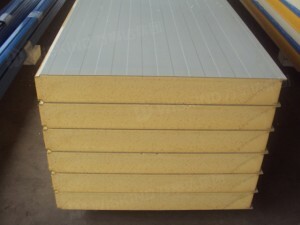 (Higher than density possible/ can be tried)EPS Roof (Hi Rib) Panels, EPS Flat Panel with Tongue & Groove joint. Advantage of EPS sandwich Panels : Low maintenance and Long life, Durable Thermal insulation, Water and vapour Barrier, Less weight , Load bearing.